Life University Names New Amphitheater After Standard Process Inc.
Standard Process Inc. (http://www.standardprocess.com) recently joined Life University (http://www.life.edu) at its Atlanta campus for the dedication of the Standard Process Amphitheater. University officials named the amphitheater after Standard Process to express their gratitude for Standard Process’ $500,000 contribution towards the creation of Life’s William M. Harris Center for Clinical Education. The Center serves as a clinical training and assessment facility. 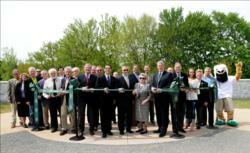 Standard Process President Charles C. DuBois and Vice President Sylvia DuBois (pictured center) were joined by members of the Life University board of trustees and other Life executives and guests, including the Life mascot, Doc, to cut the ceremonial ribbon at the dedication and grand opening of the Standard Process Amphitheater, the highlight of the University’s new Lyceum Park. The new park serves as a green space where students and faculty can gather to learn, reflect and relax. For more than 80 years, Standard Process, headquartered in Palmyra, Wis., has provided health care professionals with high-quality, nutritional whole food supplements. Standard Process offers more than 300 products through three product lines: Standard Process whole food supplements, Standard Process Veterinary Formulas (http://www.spveterinaryformulas.com), and MediHerb (http://www.mediherb.com) herbal supplements. The products are available only through health care professionals. Standard Process is involved in every step of production. The company grows crops on company-owned, organically certified farmland, utilizes state-of-the-art manufacturing processes, and employs the highest quality control standards. Standard Process strictly adheres to the Food and Drug Administration's good manufacturing practice requirements. Through these measures, Standard Process can ensure that its products are of the utmost quality. Standard Process was recently named a Top 100 Workplace in Southeastern Wisconsin. For additional information about Standard Process, visit http://www.standardprocess.com.